On the one hand, pet photography is a skill that can be learned. There are professional photographers who, while they usually charge an arm and a leg, can all but guarantee to provide you with the perfect photo of your pet every time. On the other hand, landing the perfect photo of your pet can sometimes come down to little more than sheer luck and good timing. As pet lovers worldwide would understand, there are days when you can follow your pet around for hours and snap hundreds of photos that are blurry at best and boring at worst; then there are other times you’ll whip out your camera, take one photo and find that for one magical moment, everything lined up. There are ways to move from luck to skill on the photography spectrum, though, and these 8 tips should give you an edge the next time you want to take a happy snap of your pet. While lighting is important in any kind of photography, it is especially crucial when it comes to taking photos of pets. Wherever possible, avoid using a flash for a number of reasons which range from redeye problems to the possibility of scaring your pet. Natural light is always the best lighting option, with a few caveats. For pets with dark hair, try to photograph them in a very well lit area and, conversely, pets with white for other pale colouring should still be photographed in natural light, but out of direct sunlight. Active pets are certainly more difficult to photograph than their lazier counterparts. The trick to capturing the perfect freeze-frame action shot of your active pet is to make some changes to the shutter speed of your camera. If you are somewhat comfortable with manually changing the settings on your camera, opt for a fast shutter speed and play around with the aperture until you get the right mix. If the thought of fiddling with your camera’s settings terrifies you, simply choose ‘sports’ mode to tell your camera to look out for a fast moving object. Mastering these setting changes while making good use of your camera’s continuous or ‘burst’ mode will give you the best chance of success. They say a picture is worth a thousand words, so use those thousand words to tell the true story of your pet. Instead of simply aiming to show how beautiful your pet is, aim to also capture an essential part of your pet’s personality in your photography. The easiest way to do this is to photograph your pet doing their favourite activity, playing with their favourite toy, or doing something that they are famous (or infamous) for. For example, if your dog is known for faithfully sitting by the door until you return home from work, snap them in that pose. If your pet is famous for begging for food at the table, take your photographs in that setting. A good photograph is one that accurately portrays the true character of its subject, so aim to go a step beyond simply capturing the beauty of your pet. 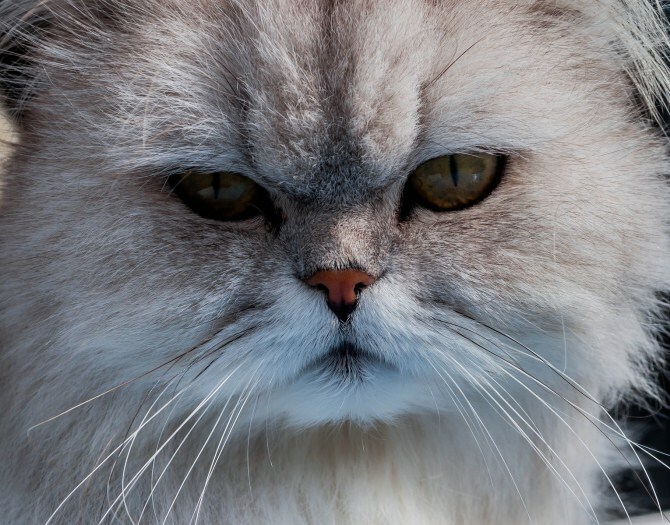 Some of the most effective pet photographs are those that are right up close. Experiment with focusing on one feature of your pet: their nose, for example, or eyes – and play around with different camera setting until you’ve got the perfect shot. You may be surprised that your favourite photo of your pet is one that doesn’t even include your pet’s whole face, let alone their body. At the very least, it’s something to experiment with. Unlike wild animals, pets do not exist in isolation. Pets are an addition to and a sometimes essential component of the family structure, and including other members of the family in the photos of your pet can bring your photography to a whole new level. 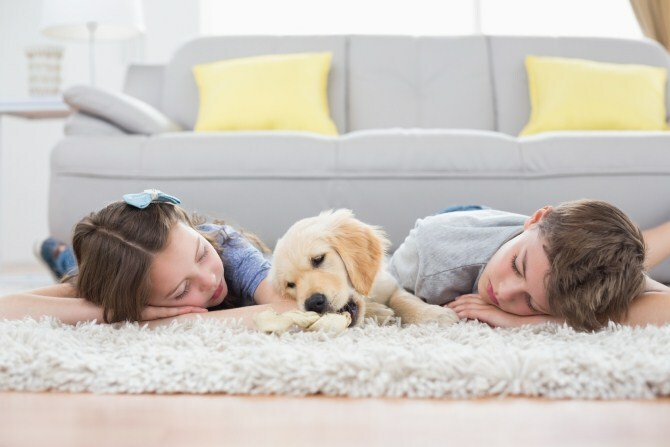 Try a mixture of posed and candid shots: including action shots, for example, the kids hard at play with your dog; to relaxation shots such as a cat snoozing peacefully on someone’s lap. A simple pet photography hack to try is to follow your pet around for a little while and wait until they get themselves in a comfortable position. 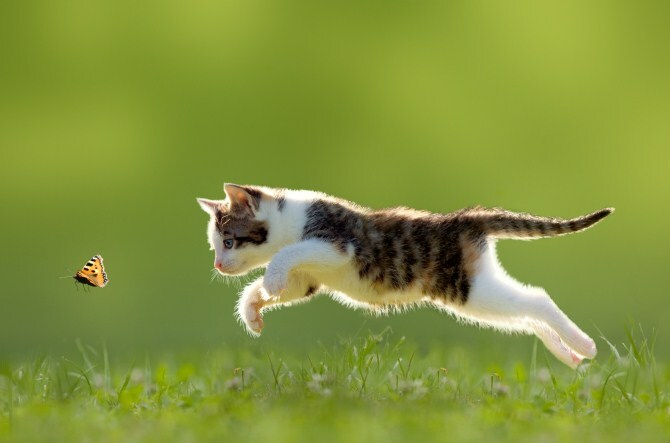 For the more sedentary animal this should buy you plenty of time, though for an active puppy or kitten you’ll still need to be quick on your feet. 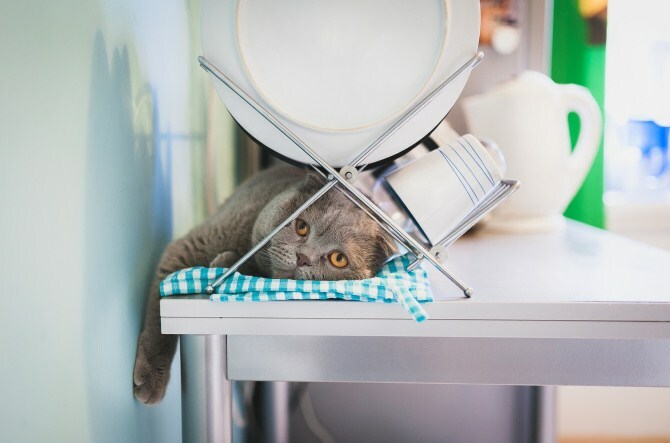 Set up the shot as if you were getting ready to take a relaxation photo, and when everything is set up, have someone else call your pet’s name, whistle, or make some other noise that is sure to get your pet’s attention (the rattle of a food tin, perhaps?). You then have a small window of opportunity to take a photo of your pet alert and responsive, while still in a stationary position. Use that time wisely! Taking a new perspective on life is not the easiest thing to do, but the task is made simple when you’re talking about photography. 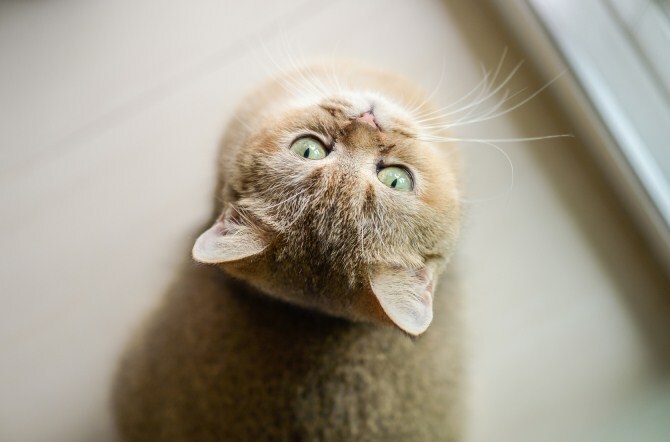 To take a new perspective on your pets, simply change the angle of your camera. The world looks different through the lens of a camera, so try out this experiment with your camera rather than just your eye. View your pet from behind, directly from above, and from an even greater height. If you can, view your pet from below as if you were much shorter than them. 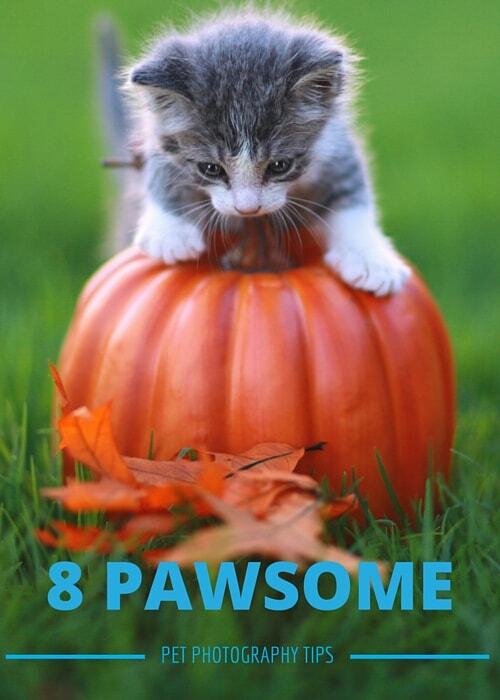 This can be made easier by positioning your pet on a table or other elevated surface, allowing you to get underneath. There have been some amazing photos taken from below of pets lying on glass tables. The trick here is to experiment and to think of new ways to view your pet. ‘Pet selfie’ is a bit of a contradiction in terms, as ‘selfie’ implies that the subject of the photo is the one operating the camera. And unless your pet is super clever, this won’t be the case: however you can achieve the same effect with a bit of creativity. 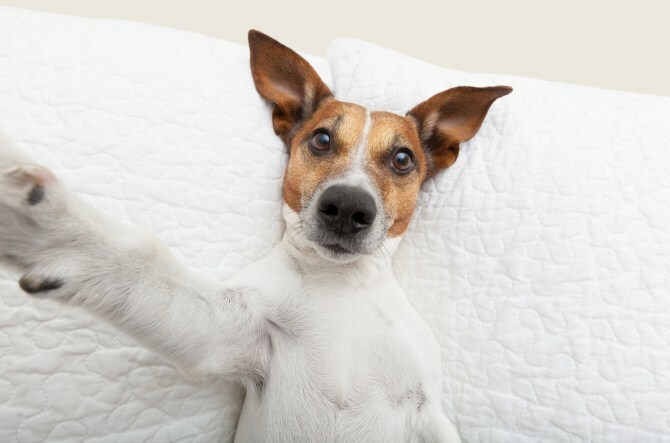 All you need is to have your pet looking directly at the camera and to have their arm out in such a position as it looks like they’re holding the camera themselves. 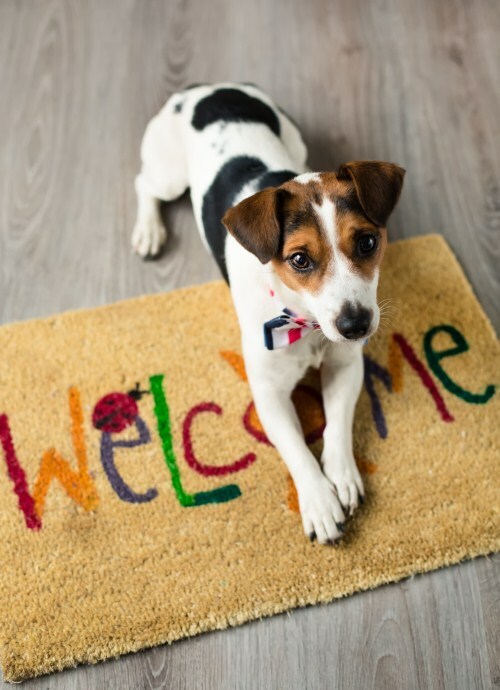 This will be easier for some pets than others, and may be as simple as holding out a favourite toy or rubbing or scratching your pet in the perfect spot to get them to release their control on one arm. If you have a very amiable pet, you could try having someone gently holding your pets arm in the right position (provided your pet isn’t distressed by this, of course) and taking the photo immediately after the arm is released. This may be easier said than done, but the end result – if you can achieve it – will be incredibly effective. 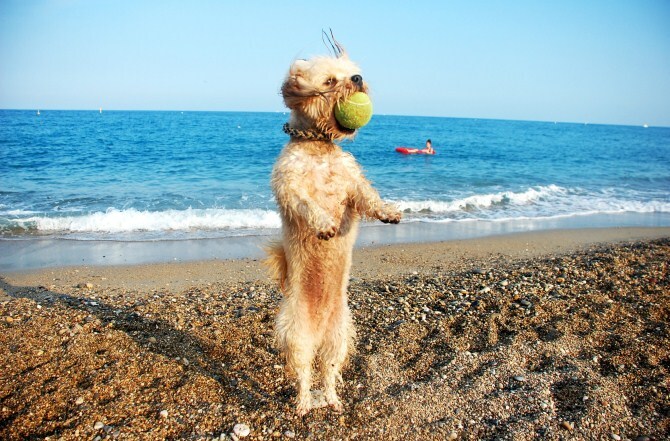 Hopefully you’ve gained a few new ideas to try the next time you’d like to take a photo of your pet. And once you’ve taken that perfect photo, first back it up to the cloud, and then upload it here and we’ll effortlessly turn it into professional stunning wall art for your home – without the price tag.